This disclaimer (“Disclaimer”) will be applicable to the Website. By using or accessing the Website you agree with the Disclaimer without any qualification or limitation. M/s. 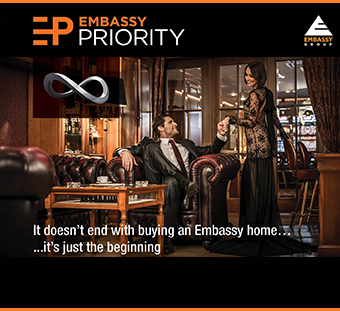 Embassy Property Developments Private Limited (“The Company”) reserves the right to add, alter or delete material from the Website at any time and may, at any time, revise these Terms without notifying you. You are bound by any such amendments and the Company therefore advise that you periodically visit this page to review the current Terms. The particulars contained or the details mentioned in respect of the Projects / developments undertaken by the Company including depicting banners/posters of the Project/development are being modified in terms of the stipulations / recommendations under the Real Estate (Regulation and Development) Act 2016, and Rules made thereunder (“RERA”) and accordingly may not be fully in line thereof as of date. You are therefore, required to verify all the details, including area, amenities, services, terms of sales, payments and other relevant terms independently with the sales team/ company prior to concluding any decision for buying any unit(s) in any of our projects/developments. Till such time the details are fully updated, the said information will not be construed as an advertisement. To find out more about our projects / developments, please telephone our sales centres or visit our sales office and speak to our sales staff. All content including brochures are purely for general informational purposes only. It is not meant to constitute an offer or solicitation. No furniture or accessories or any other item of personalized nature shown in any of the visuals are provided with the unit. All intending purchaser/s in any of the projects shall be governed by the terms and conditions envisaged under The Real Estate (Regulation and Development) Act 2016. Nothing on the website should be misconstrued as advertising, marketing, booking, selling or an offer for sale or invitation to purchase a unit in any project by the company/firm. The company/firm is not responsible for the consequences of any action taken by the viewer relying on such material/information on this website. To find out more about projects/developments, please call +91 88 8005 0000 or visit our sales office during working hours and get in touch with authorized sales representatives of the Company.